While viewing a recent TV episode, I found myself mentally veering wildly off the subject, and engaging in a little impromptu family history research. I was watching TLC's Long Island Medium (http://www.tlc.com/tv-shows/long-island-medium), where the subject of the show is followed by cameras, as she delivers messages from departed loved ones to their families and friends. These segments are spliced together with funny scenes from the medium's family life. Whether you believe that her process is possible or not isn't the point: it isn't a documentary. I just consider it light entertainment, and treat it like a guilty pleasure. On the episode in question, the medium and her daughter take a long weekend in upstate New York. One of the stories is set on a farm. In the background of one scene is a silo, on which you can see the name "Hull" in fading paint. I was immediately interested, because I've often seen the name Hull appear in close proximity to my ancestors in colonial New England. Having studied my ancestors for 33 years, it should come as no surprise that the urge to go into research mode never completely diminishes, no matter what I'm doing. Katie Lois “Babe” Ives Eckerson was the youngest of six surviving children, born in 1904 to Charles A. and Mary Catherine Myers Ives. Although her parents raised her in the Church of the Brethren, that didn't keep Babe from pushing the boundaries of the religion’s conservative dress code. It also didn't keep her from enjoying a social life. 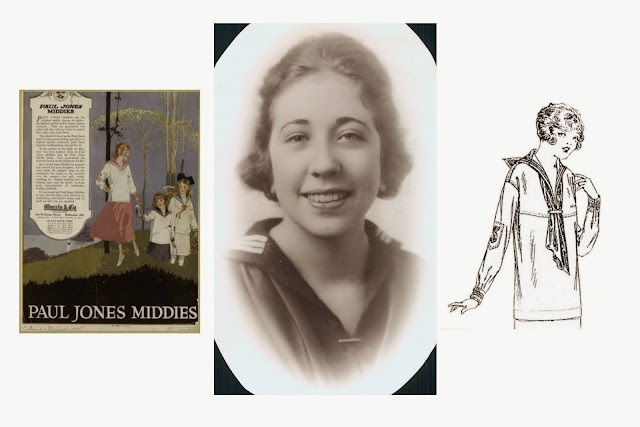 As Babe was growing up, the “Middy” came into fashion. This was a sailor style blouse, which got its name from the naval rank of “midshipman.” With its comfortable, loose fit, it was a welcome departure from earlier styles. It was generally accessorized by the addition of a tie in the front, often in a contrasting fabric. Babe said that during this time, the ultimate fashion score a real naval tie obtained from an actual sailor. Perhaps this was on her mind when she considered potential suitors. Boyfriends, other than the man who was to become her husband, were rarely discussed. I only remember one or two conversations of the kind, and she was rather embarrassed to admit having kept company with anyone before her husband. However, there was one young man, who became part of a memorable story. He escorted Babe to a local fair. I'm not sure whether the possibility of obtaining a naval tie was part of this young man's attraction or not. Babe was an older teenager at this point, as she married in 1923 at the age of 19. The fair featured various carnival games, including one known as the “High-Striker,” “Test Your Strength,” or “Strongman." 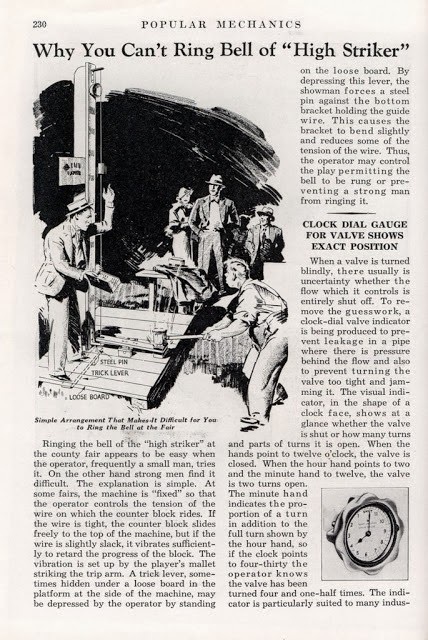 This is the one where a mallet is used to hit a lever; a winner rings the bell at the top. Babe and her swain proceeded to enjoy the amusements of the fair, and ended up arriving home late. This wasn't unusual during her teenage years of pushing the fashion and courting boundaries. On this occasion, however, her parents were somewhat conflicted as to whether to punish her for being late. It turns out that farm girl Babe, in her loose-fitting Middy blouse, had taken a swing at the "High-Striker," and managed to win one of the top prizes. This was long before the days of iPads or big-screen TVs. No, this was something the family could really use: a ham and a bucket of lard!